Mailchimp only adds NEW email addresses to your Mailchimp lists (not addresses already on or previously deleted from your mailchimp list). Please use a NEW email to test email capture tools. 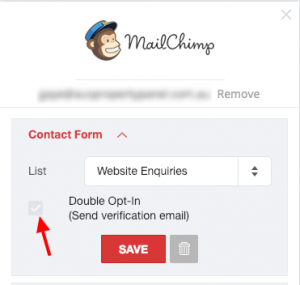 Also, if you click ‘double opt-in’ on the zotabox setting page (https://zotabox.com/dashboard/emailservices/) your customers will need to click the confirmation link in a verification email to be added to your mailchimp list. You can uncheck this box to allow for single opt-in (without verification step). Note: Your field names must be the EXACT SAME NAME on your Zotabox setting page and your Mailchimp list to integrate correctly. Please make sure first and last name are ‘not required’ in Mailchimp. In Mailchimp, go to ‘Lists’ – ‘Settings’ – ‘List Fields and *MERGE* Tags’. Make sure First and Last Name ‘Required’ Boxes are UNCHECKED.